Eros lives in the Wild of New Hampshire. Well, not exactly! He lives in a very small house with an elderly couple, minding another dog and a cat, while keeping guard of 20 acres of farmland, and chasing away deer and turkeys daily. In this dog world, he’s the undisputed alpha dog – literally. When not transcribing his life story to Eva, Eros, now an accomplished philosopher, holds court with squirrels, raccoons, bears, cardinals and bluebirds who come by his house, partaking in his wisdom. In between these soliloquies, he wards off coyote attacks with one paw and a mighty bark. 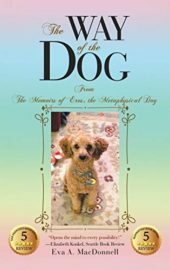 Dog lovers and anyone whose interest may be aroused by this tale will want to join us Monday, April 29 at 6:30 p.m. in Taylor Community’s Woodside Building for Eva’s lecture and book signing. This free event is open to the public.